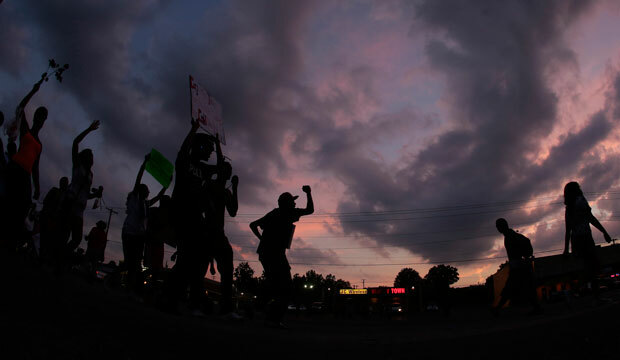 Is Trouble in Ferguson a Design Failure of its Government Structure? In the coming days, a Missouri grand jury will render a decision on whether to indict Darren Wilson, a white police officer of Ferguson, Missouri’s, police department, for the fatal August 9 shooting of Michael Brown Jr., a black teenager. The shooting set off weeks of protests and violence in Ferguson, and police in the nearby St. Louis area are bracing for more protests in the wake of the decision. Sam Fulwood III, the regular writer of the “Race and Beyond” column, asked Eric Garland, who lives in the St. Louis area, to share his insights into how and why the shooting sparked both national and international attention. Garland, who has been mentioned in this column on issues related to international relations and presidential politics, turns his attention to what is happening in his own backyard, arguing that the St. Louis area’s tangled and unaccountable political structure is culpable for what is transpiring in Ferguson. Since the death of Michael Brown Jr. at the hands of Police Officer Darren Wilson in Ferguson, Missouri, on August 9, unprecedented global scrutiny has descended upon St. Louis’ civic institutions. As tensions between the public and various government authorities spiraled out of control, people around the world wondered aloud, “How could this happen, who is in charge, and what must be done to restore legitimate justice and order?” In the wake of mass protests and a militarized police response, there have been no easy answers. Now that Gov. Jay Nixon (D-MO) has declared a state of emergency in Missouri, the world is looking at the whole area surrounding St. Louis in bewilderment once more. What we are witnessing is a crisis of governmental design. For anyone unfamiliar with the odd legal and political structure of the greater St. Louis area, I would suggest that fundamental flaws exist in the region’s governance. Structural reforms will be required to establish confidence in law enforcement and political leadership, as well as to maintain justice among the citizens in the state of Missouri. One of the first aspects of the St. Louis metropolitan area that intrigues people unfamiliar with the city and its suburbs is the sheer number of municipalities. There are more than 100 municipal governments in an area that includes nearly 3 million residents. Most famous is the city of St. Louis itself, with a population of nearly 320,000 people, but then there is St. Louis County, which surrounds the city and includes many small municipalities of around 15,000 people each, including Ferguson, Florissant, Maplewood, Ladue, Ballwin, and others. Due to political and economic conflicts between St. Louis and the surrounding county, the entire county populace voted in 1876 to establish the city as an independent municipality. Since 1877, when the “Great Divorce” went into effect, each town in the county has governed itself separately from the city, with all of the taxation and infrastructure responsibilities that come with self-governance. St. Louis—both the city and the county—grew to be the fourth-largest city in America by the turn of the 20th century. From that time on, the growth of the region has tottered with tension between urban and rural areas. The newly divided individual municipalities were center stage for some significant moments in America’s troubled racial history. Following the end of Civil War, the booming city of St. Louis became a destination for many African Americans seeking relief from the perversions of the Jim Crow South. Straddling three rivers and a major crossing of the Mississippi, the city’s geography provided the perfect backdrop for economic activity and employment as the region boomed. While African Americans taking part in the Exodus of 1879 in the direction of Kansas, a former free state, many stopped to settle in St. Louis, beginning a long history of tensions with the local, white-dominated power establishment. The history of race relations in St. Louis is too long and complicated to adequately address in this column, but suffice it to say that there have been two major Supreme Court cases addressing racial divides that sprang up from this area. Shelley v. Kraemer struck down the enforcement of racial covenants designed to keep certain areas of the St. Louis region white by legally forbidding people to sell houses to black families. In Liddell v. Board of Education for the City of St. Louis, the Supreme Court found that the de facto segregation of schools separating the area’s citizens into smaller municipalities was unconstitutional. What began as a system that represented a rural-urban divide evolved into a representation of the racial and socioeconomic divisions in the greater St. Louis region. The system has major structural contradictions and palpable social tensions, but it has functioned well enough to maintain an uneasy status quo. The problem we are now seeing in Ferguson is that this tenuous status quo is being torn apart, and the design of the current governmental structure is failing before our eyes. As soon as protests over the Michael Brown shooting grew, the Ferguson police responded belligerently, and chaos ensued. Police departments from around St. Louis County responded with military gear—equipment that none of the officers were properly trained to use. After two days of the unified St. Louis County Police tear-gassing residents in “their own backyards,” arresting journalists, and referring to citizens as “animals,” the weight of the world’s scrutiny descended upon the democratic institutions of St. Louis to ask, “Who the hell is in charge?” The scary yet accurate response was that nobody was in charge. In Ferguson, the police are technically under the control of a city manager, not a democratically elected body or mayor. Historically, this arrangement was implemented with the best of intentions. Back in the day, Chicago-style politicians regularly used police officers as mafia-like muscle, and this municipal design avoided “politicization” of the Ferguson police. So when Ferguson Mayor James Knowles stated on television in August that he “can’t second-guess these officers,” he was simply being accurate. On November 17, when reporters asked Gov. Nixon with whom the buck stops for the policing of protests, he pointed to the unified command of the Missouri State Highway Patrol, the St. Louis County Police Department, and the St. Louis Metropolitan Police Department. The law enforcement patrols also included the Missouri National Guard and the Federal Protective Service of the U.S. Department of Homeland Security. But the governor was not in charge, and neither was any other single authority figure. This is a design failure. Ferguson is treated as a separate entity from the rest of St. Louis, despite that fact that its crisis clearly affects millions of people throughout the area. A democratic body does not oversee the Ferguson police, though they make life and death decisions involving the community’s residents. A democratic chain of command has not been established and is not even mentioned by the highest-ranking politician in the state, who informs us that, despite the events that occurred in August, the police remain in charge of themselves. On top of it all, the federal government has shown zero effectiveness in demonstrating how the rule of law might be maintained in a place where the unthinkable has arrived in just a few short weeks. Focusing on the individual actors obscures the real problem in Ferguson: a byzantine system of government that resembles a Kafkaesque bureaucratic nightmare more than the wise, rational governing systems proposed by the Founding Fathers. The self-regulated, militarized police force emerged as the result of changes in police authority across the country following the terrorist attacks of September 11, 2001. The USA PATRIOT Act directly led to many initiatives that go well beyond defending against terrorists and toward a radical transformation of the relationship between the state and its citizens. Luckily, this mashup of unchecked authority masquerading as bureaucracy has not invaded the whole of our nation’s body politic. The majority of our nation’s judicial, police, and military institutions answer to civilian authorities, as well as to judicial and legislative checks and balances. But as we expand the reach of law enforcement agencies beyond their missions—or empower tiny municipalities to deploy military hardware absent training or oversight—we drift further into a place where there is power without accountability. In places such as Ferguson, the fundamental flaw—a lack of clear civic accountability—is an indictment of an entire municipal system. As a result, we have a government that runs itself, and runs amok. Eric Garland, who lives in St. Louis, is a strategic trend analyst who works with executives of corporations and governments around the world. The views expressed here are his alone and do not reflect those of his clients or the Center for American Progress.